The Korean misadventures of a rehabilitated news writer. I decided to document every lunch I ate for a week. Korean school lunches are profoundly different from American school lunches, and I am convinced they play a vital role in why Korea doesn't have the obesity epidemic currently facing America. 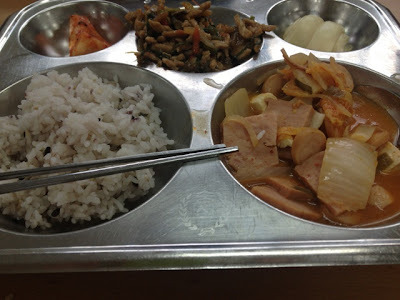 Monday: Stir-fry noodles, pork ribs, seafood soup with bean sprouts and octopus tentacles, rice, and kimchi. Tuesday: stir-fried mystery meat, a roll of rice dough, spam soup with other mystery meat, rice, and kimchi. This was a disappointing special food day. Some days we have 'spaghetti" or "pizza." 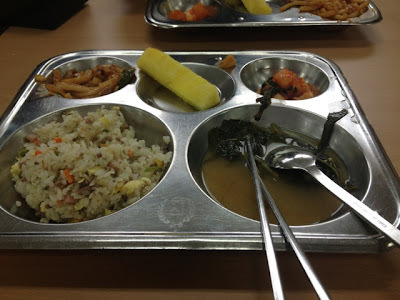 This week it was bibimbap, friend octopus bits, pineapple(!!! 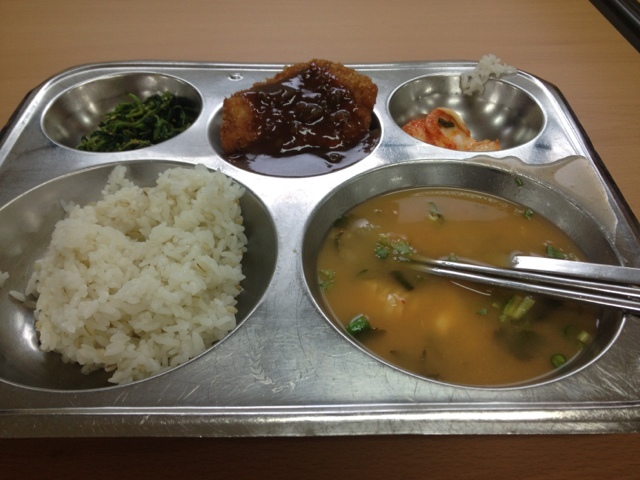 ), seaweed soup, and kimchi. 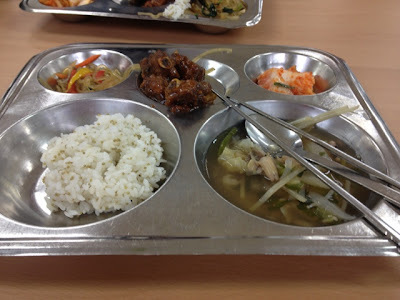 Friday: Dalk Galbi (spicy stir-fried chicken), corn on the cob, kimchi, seaweed soup, and rice. Friday was special because we got lettuce to make little wraps with our chicken and rice. So this is a typical week of lunches for Korean students. I'm no expert, but if I had to go out on a limb and say why Korea has a vastly lower obesity rate than America, I'd say this has something to do with it. Want to read my story from the beginning? Coming home from Korea, and being expected to tip everywhere..